SILICON SLOPES, Utah — March 5, 2015 — Today Domo announced that Stance CEO Jeff Kearl will join Domo founder and CEO Josh James on stage at DomopaloozaTM. Kearl will share how Stance, a retail leader and innovator in artistic sock design, is leveraging data and Domo to improve business performance. Stance is a company all about originality and self-expression. 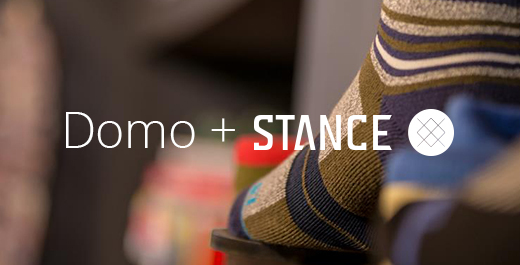 With Stance socks being sold by nearly every major retailer in the U.S., the ability to see a complete view of its business – from inventory levels to sales and financial metrics – was a driver in the adoption of Domo. Domopalooza, Domo’s inaugural user event, is designed to educate, inform and inspire Domo’s fast-growing community of top-flight customers. From hands-on, personalized training to breakout sessions and keynote presentations, attendees will gain valuable insights from fellow customers and industry experts on how to best leverage Domo, their business data and industry best practices to operate more effectively and improve business results. During Domopalooza, Domo will showcase how its business management platform delivers a transformative experience with enterprise software. In addition to publicly unveiling its highly anticipated product, which is still only viewable by current customers and prospects under NDA, Domo will reveal three new products. To learn more about Domo and how Stance and other successful organizations are using Domo to get more value from their business data, register for Domopalooza on April 7-9 here. Domo is a cloud-based business management platform that gives CEOs, managers and information workers across the business the ability to make faster, more effective decisions by giving them one place to easily access all the information they need. With $250 million in funding, Domo is backed by an all-star list of angels and investors including Benchmark, Fidelity Investments, Founders Fund, GGV Capital, Greylock Partners, IVP, salesforce.com, TPG Growth, T. Rowe Price, WPP and Zetta Venture Partners, plus CEOs of the world’s largest SaaS and Internet businesses. For more information, visit www.domo.com. You can also follow Domo on Twitter, Facebook, LinkedIn, Google+, Instagram and Pinterest. To learn from industry experts and thought leaders on how to leverage data and Domo to transform the way business is managed, attend Domopalooza, April 7-9, Salt Lake City. Sign up here. Domo and Domopalooza are trademarks of Domo, Inc.